It’s that time of year! 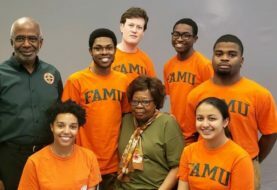 Florida A&M University (FAMU) is bringing back food, fun, and cultural awareness at the 4th annual free community event, the FAMU Harambee Festival! Celebrate unity in the community on Saturday, February 23 from 11 a.m. – 6 p.m. at Cascades Park (1001 S. Gadsden St.). Event guests will enjoy live performances, vendors from across the region, cultural art and a fashion show, workshops, and food trucks! Highly acclaimed international artists Sunni Patterson and Cody Chesnutt will headline the event. Patterson, having performed at the Essence Festival and on HBO’s Def Jam, brings an artistic fusion of poetry, activism, and singing to her culturally aware performances. Known for his collaboration with Grammy Award-winning band The Roots, Chesnutt’s soul, funk, and R&B style will add a flair of spirited artistry to this annual community celebration. Plan how you’ll spend the day and download the FAMU app to view the full event schedule.